You don’t require lots of time or space to have a beautiful garden. Whether your garden is large or small, urban or country, traditional or contemporary in style, you will always be able to find space for plants in pots. 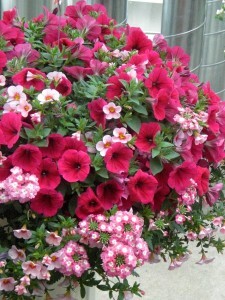 The real appeal of container gardening is that they offer instant gardening and versatility. Create miniature landscapes around your deck or patio by filling containers with your favourite plants. Apartment or condominium dwellers can create lush retreats on tiny balconies or they can grow large scale gardens entirely in containers on building rooftops. Even if you only have a wall and window, you can create window boxes or hanging baskets filled with trailing plants, herbs or vegetables. Anything is possible; you just have to have some imagination. Colour combinations are very personal creations. Different colours have different personalities. Warm colours – those related to reds, oranges, or yellows – are bold and strong. They are stimulating and appear closer to the viewer. Cool colours – those related to violet, blue or green – are more calming and tranquil and appear to recede from the viewer. 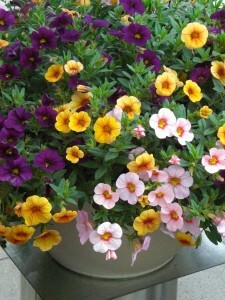 Mixing warm and cool tones will add interest and depth to the container plantings. To get the maximum effect out of your container garden, think about colour combinations when purchasing plants. Groupings of one or two dominate colours usually look the best. To create contrast and excitement, choose complementary colours like yellow and violet, red and green or blue and orange. 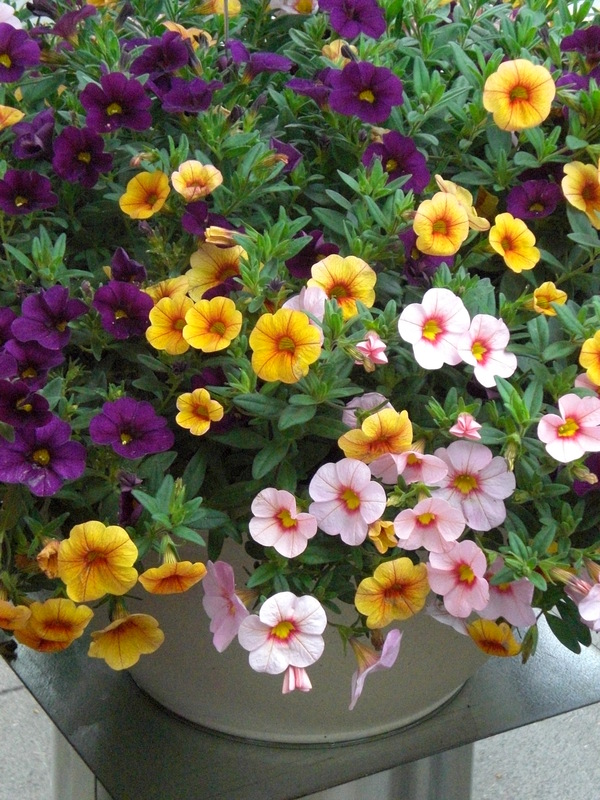 For instance, a yellow accent such as Tried & True Bidens ‘Goldilocks’ looks great with a group of blue or purple flowers, such a Tried & True Torenia ‘Purple Dream’ and Tried & True Petunia ‘Deep Blue’. Sometimes, a mixture of many different colours can look too “chaotic or busy”, but you can create a beautiful grouping with several shades of the same colour. Place a light hue next to a very bright or dark shade of the same colour (try pale pink next to fuchsia or burgundy). For example, Tried & True Diascia ‘Light Pink’ and Tried & True Calibrachoa Sweet Chimes ‘Red Wine’ would look particularly good together. Gray and white are not part of the colour wheel, but they play an integral role in garden plans. Silver or gray foliages can unify two complementary colours or bold colours. White can be exciting or soothing. Bright white can be bold next to bright and dark colours. White is also an excellent accent colour – it looks good with virtually every colour from silver to black. Muted whites or creams are softer when combined with soft pastel colours. The most ideal combinations are not just based on flower colour; they will depend upon space, climate, season of bloom and quality of plants, too. A mass of blooms all from the same plant can create great impact, so don’t be afraid of using single-variety plantings in large quantities. The key to success lies in choosing a container that complements both the colour and the habit of the plant. Good combinations also feature different plant heights and forms and texture of the leaves. Texture and form are just as important as colour in creating interesting plant combinations. Balance rounded foliage with spiky plants. Contrast shiny or glossy leaves with velvety or fuzzy leaves. Contrast fine foliage with smooth broad leaves. The value of foliage should not be underestimated when planning a container garden. Foliage is valuable as a design element in its own right. Leaves come in an array of different colours; from the blue green to the yellow-green to the silvery green. Containers using strictly plants prized for their foliage such as Coleus, Strobilanthes, and Setcreasea make beautiful plantings because they add depth and texture. 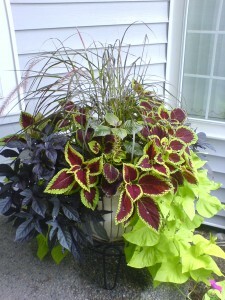 There are 3 key ingredients in making breathtaking container plantings: Thriller, Fillers, and Spillers. Planting the right combination of the 3 ingredients creates a lush, interesting container rich in colour, texture and form. Remember to keep proportion in mind; try to use fillers that are roughly between 1/3 and 2/3 the size of the thriller. Thrillers: A dramatic and eye-catching centerpiece plant that is usually big, bold and beautiful. These architectural or structural plants are usually tall, upright plants, with outstanding traits such as: colourful foliage, dramatic flowers or intriguing shape. As a general rule, the thriller is planted in the center of the pot that will be seen from all sides or at the back of a pot that will be placed in a corner or against a wall. Fillers: Flowering or foliage plants to complement, but not overshadow the thriller plant. They add mass and fill up the overall composition of the container. Fillers serve as textural contrast and tend to be more airy, more finely-textured plants that surround the thriller. Spillers: The main objective of these trailing plants is to spill over the side of the container, creating a softer edge and tumbling toward the ground. The pot visually looks anchored or grounded to its location. Choose spillers to echo or contrast with the other plants in the container, keeping in mind their shapes, colours, and textures. As long as these three types of plants are used in proportion, making sure to balance colour and textures, you can create a spectacular and breath-taking container. Careful planting gives containers an excellent start, but providing the best possible growing conditions and supplying some tender loving care will keep them looking their best. Water them regularly. Depending on the size of planted container, variety of flowers, wind and temperature, you may have to water daily or even twice daily for small pots, clay containers and hanging baskets. A general rule is to wait until the top 1 inch (2.5cm) of container mix is dry; then water well, until some water comes out of the bottom. Early morning or around dusk is the best time because you risk scorching the leaves if you water them when the sun is shining. Water retaining granules mixed in the potting mix will also help the container maintain moisture levels. Regular deadheading. Depending on the plant variety, picking off dead or fading flowers (process known as deadheading) helps to prolong flowering and encourages more growth – remember to check the plant labels. Feeding. If you didn’t use a slow-release fertilizer when you planted your container, you will need to feed it regularly with a high nitrogen plant food. You can use diluted fish emulsion, seaweed extract, or a balanced organic fertilizer. Be sure to follow the instructions on the package to find out how often and how much fertilizer you should apply.